Fix Don’t Replace | The Barbour Repair Shop | A Continuous Lean. 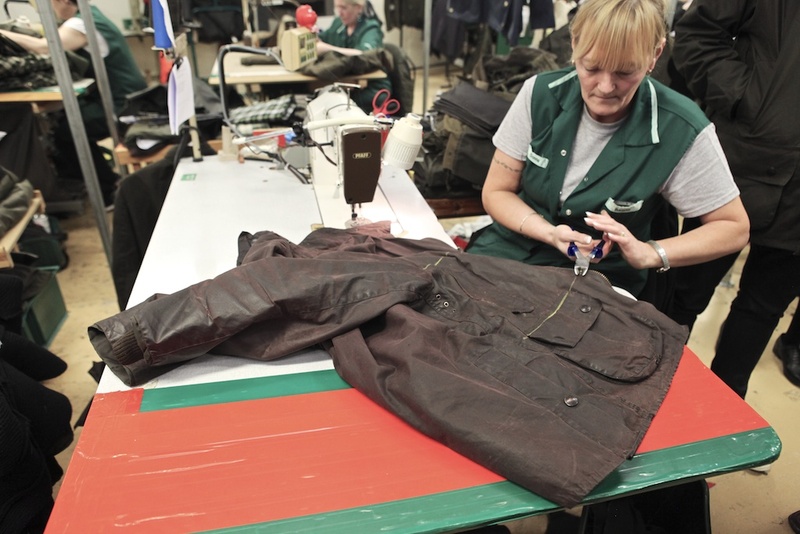 The Barbour repair shop is tucked away in a comparatively small room at the back of the main factory in South Shields, England. It’s a relatively calm space when you consider the frenetic energy that fills the factory floor not too far away. Upon entry, you immediately notice the racks and racks of well-worn old Barbour jackets that have been sent in for repair. In some cases it’s just a minor fix or re-waxing, in other cases are life or death and major surgery is required. 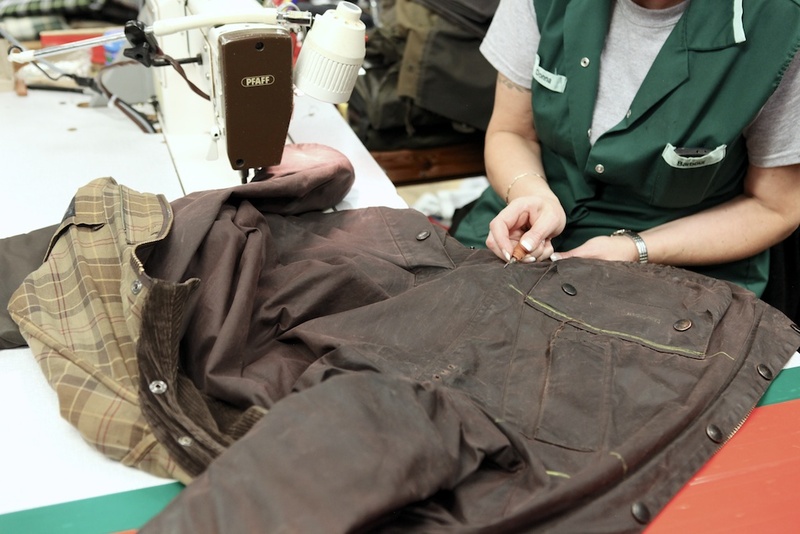 The casual observer would say: “Why go to all the trouble just to save some old ratty coat?’ While those of us who know better would instruct the men and women of the Barbour repair shop to “please do all you can to save her”. 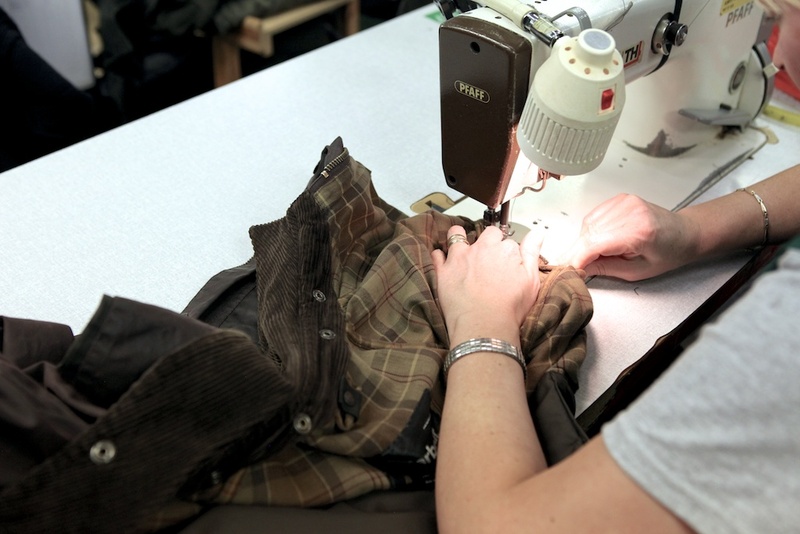 While a guest of Barbour at the factory, the ladies in the repair shop noticed the two torn pockets on my 10-year-old Bedale (don’t walk your dog on a leash with your hands in your pockets) and offered to fix my jacket on the spot. Before you know it, my jacket was on a table getting the snaps cut off with pliers and open heart surgery was underway. They promised me everything would be back in action in a few hours. Much like the Red Wing re-crafting process, an old worn Barbour coat is better than new. While it’s nice to add to your collection and get new things, old and worn is always better in this situation. Fix don’t replace is my motto. Very simply, these finely made heirloom products –an old coat, pair of boots, leather briefcase or cherished suit– are dear old friends that are worth more repaired than replaced. One look around at the tattered Bedales, Beauforts, Internationals and other assorted Barbours in the repair shop says it all. Please help my old friend. All better now. 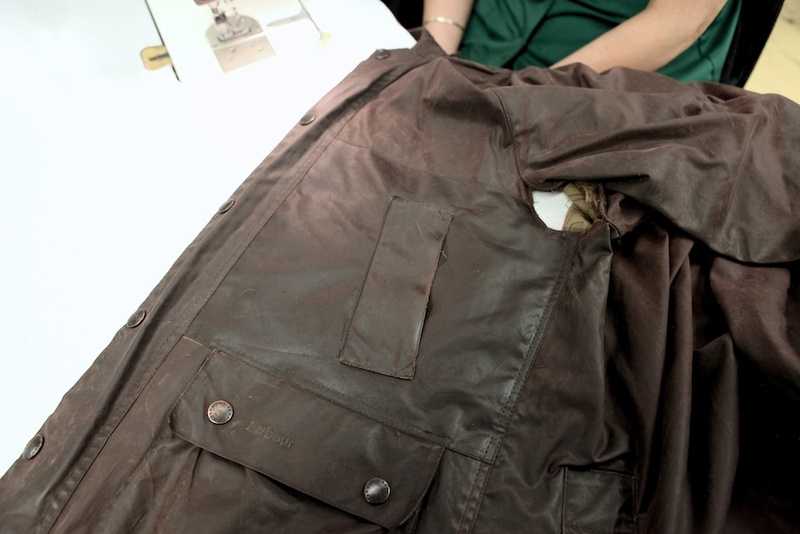 An entire front panel of the jacket was replaced – as you can see from the color contrast. I choose not to have the jacket reproofed at this time (I didn’t want to wait to have it shipped back to the U.S.), but I was told that if I did re-wax the color contrast would go away. 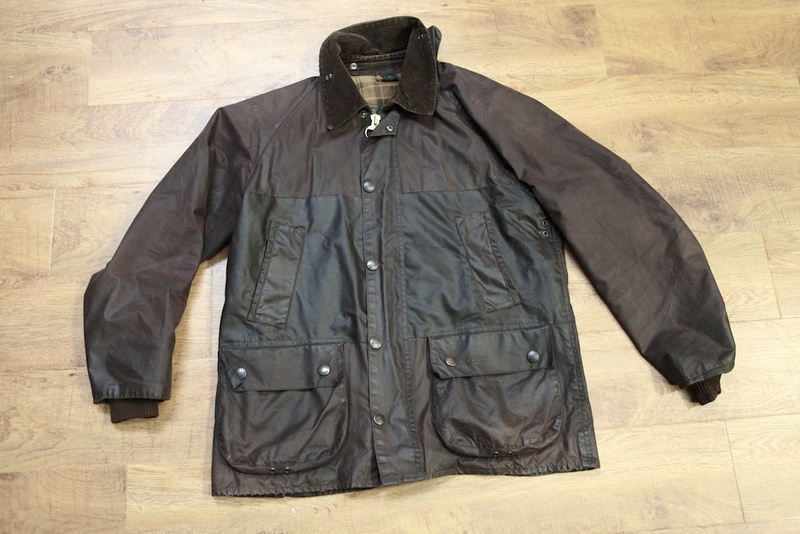 Did they tell you a secret of getting the awful smell old barbour coats have off? Mine is from the seventies and smells so bad I can’t wear it anymore. Mine has 30 or so patches and is my favorite coat ever but I just can’t bear to wear it anymore. Such a great post. I imagine there is more to come from your visit? Also, waxing is more fun when you do it yourself. Awesome post. I would love to get a glimpse at the repair and reproof operations in Milford. The company that I founded years ago, Chaco, was and continues to be the only sandal company in this country that offers repair services on their product. Offering this kind of service promotes sustainability, reduces landfills and builds brand loyalty like you wouldn’t believe. 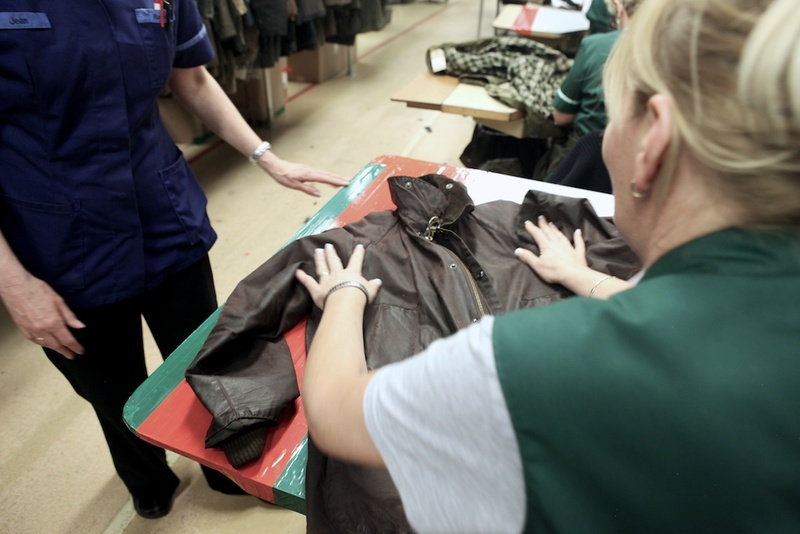 Redwing, Barbour and a handful of other companies ‘get it’ and have the in-house factory resources to make it happen. If more products were made in this country, more repair services would be available. Hats off to Barbour! Totally agree, especially if it’s an investment piece. I would love to know how to get the smell out as well! I’ve tried spraying it down with a 1 part Vodka mixture, to leaving it outside in the sun for days but it still smells like an old chest in my grandmother’s attic. brook, getting it reproofed gets rid of the smell. My ratty old coat (I love) is in desperate need & this may be the answer. Thank you. My great grandfather used to say, ‘I’m too poor to buy cheap goods.” Seems to be in the spirit of the post. I’ve got a bad zipper in my Barbour jacket, getting sent in soon. Glad to know it will be in such good hands. “Waxing” I love it. It’s really spreading sheep entrails all over your cotton coat. Orvis used to host a Barbour Day with free waxing at the old store in Manchester, VT but I haven’t seen it lately. You could always shoot them a note and see if one is coming up. I just sent mine here this morning- they have an option that gets rid of the smell…we’ll see. It was terrible! Hoping you write more about Barbour and the Bedale. I’m planning on buying a Barbour soon. What’s the best way to pick the style that’s right for me? 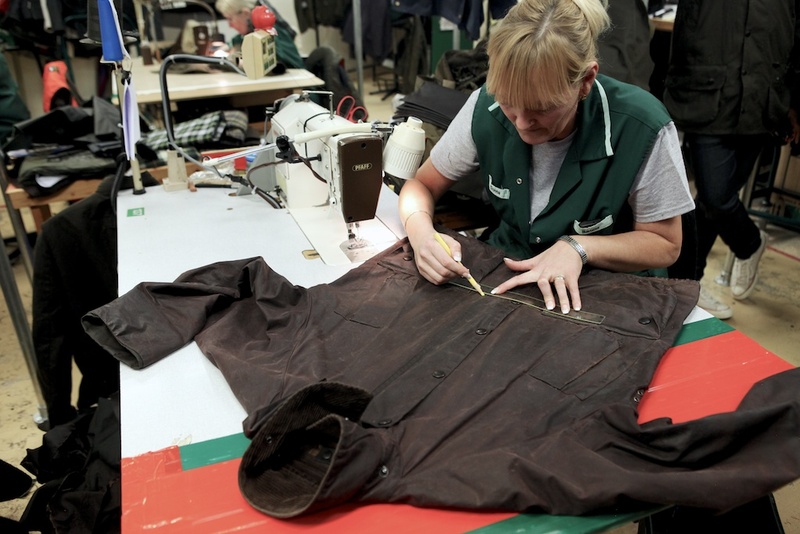 My constant fall/winter/spring companion – an aged Barbour Border – is currently under the knife at New England Reproofers as well. They’ve been marvelous to deal with so far, can’t wait to see what they do with my coat. What if you bought the coat when you where a bigger gentleman, and have since slimed down, can they fix that..? @Ty â€” they can to some degree, but it is going to cost you. 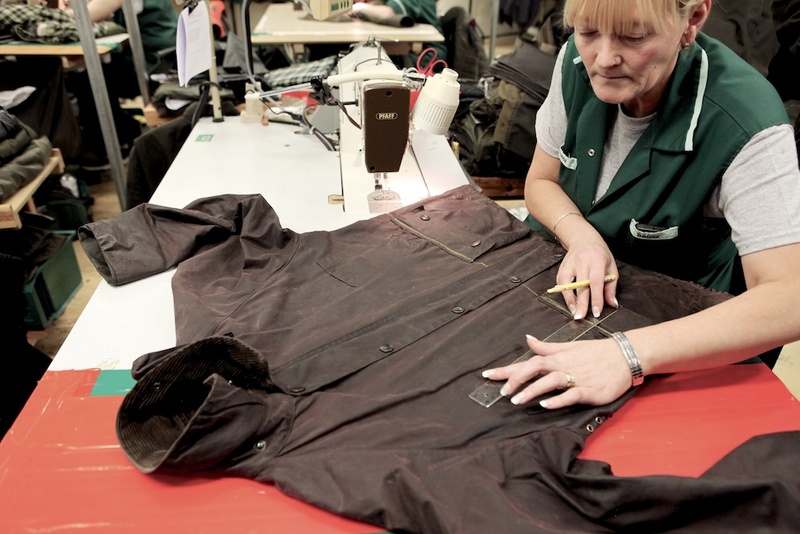 @Chris– When people pick out their first Barbour it is usually one of the classics (i.e Bedale Beaufort, or Border) The main differences between them are the length and utilitarian purpose. The Bedale is an equestrian jacket that has snaps in the back to fit over the saddle on horses of yore. Typically it’s what most men buy for their first Barbour. Its simple, classic, and just darn great. 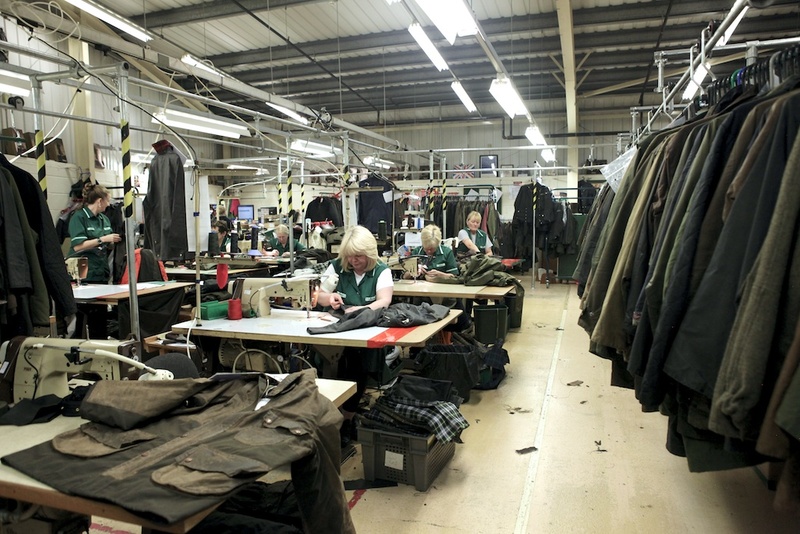 If you don’t have a Barbour shop in your area you can always call and phone order from any store and have the jacket shipped to you. @Ben, I think the smell is from inside the jacket, the lining and inside pockets (from old dog/horse treats and goodness knows what), so reproofing won’t take care of that. If any of my Barbours gets really smelly I intend to handwash the whole thing in the bath in warm (not hot) soapy water. I know you’re not supposed to wash them but I can’t see any other way of cleaning the inside. I would then re-proof it on the outside. As for all the people here talking of sending it away to be re-proofed, it’s tiresome but not too hard to do it yourself, there are even some videos on YouTube which take you through it! I sent my 20 year old Beaufort back for some major surgery last summer. Had some holes in the arms and both handwarmer pockets were torn, along with fraying on the bottom hem and cuffs. Barbour replaced large sections of the sleeves and front of jacket along with new handwarmer pocket openings. I also had leather trim put around bottom hem and cuffs. They also reproofed the jacket. All in, less than $100. This jacket has been around the world with me and served as a jacket, blanket, pillow and a stretcher for a wounded dog…I couldn’t bear to part with it. 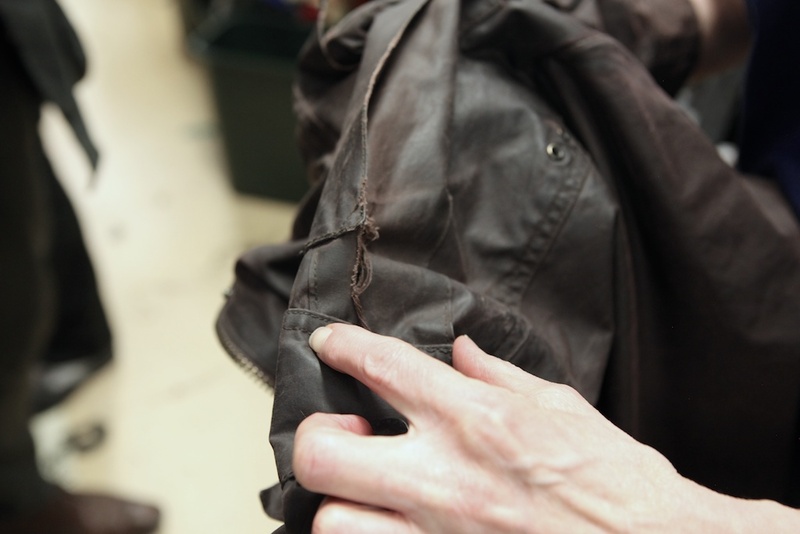 The repairs were done very well and I was without the jacket for about two weeks (in the middle of the summer). It looks like I’ll get another 20 years out of it. If you send one in for repairs, do it in the summer. Fall and winter wait times increase considerably due to volume. Ã partir de la Belgique, comment on fait. I’m living in Kain near Lille, France, can i give my classic beaufort there ? i quite like the contrast in the panels, it’s just another chapter to the story. 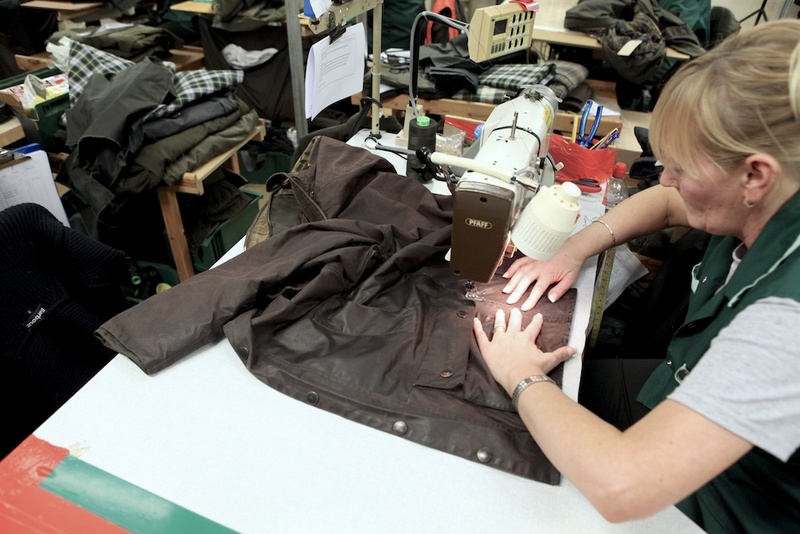 I have heard they also take Belstaff jackets in for repair! For everyone with a smelly coat, just stick it in the freezer for a few days. The cold will kill the bacteria causing the smell. Just picked up a Bedale at the Barbour outlet store in Kittery Maine over the weekend. Now I want FALL to come back. Too damn good of a deal to pass it up.